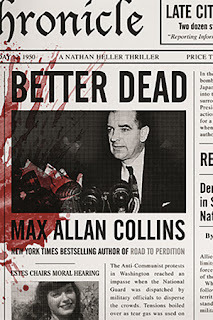 In BETTER DEAD Heller is hired by Senator Joseph McCarthy to prove that all the victims Tail Gunner Joe is pursuing are actually “Commies.” His particular interest is Julius and Ethel Rosenberg, who sit in prisons awaiting their execution. This is just how I imagined McCarthy, a drunken, ignorant Mick rummy bent on achieving massive power. He is assisted in this by none other than Roy Cohn, a vile and treacherous figure who just happened to be (half a decade later) one of Donald Trump’s mentors. Max Allan Collins not only created a new sub-genre--he is its undisputed master.